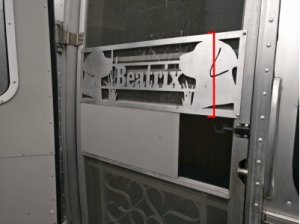 Creating custom door guards is one of our passions. We love working with our clients to create a design that is as unique as they are. 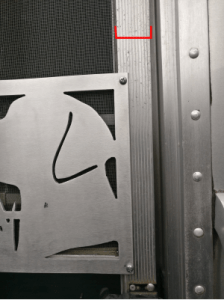 Whether your passion is Airstreams, RV’s, or Travel Trailers, we can design a door guard that will set you apart in your travels. All we need are your ideas and measurements to get started. Use the contact form to start the process or you can email us direct at contact@weatheredandworn.design. How To Measure: We need the width from outside edge to edge of your screen door frame. Next measure the width of one side rail. Finally, measure the height of your current door guard. How to Mount: We don’t precut the mounting holes. There are just too many variables to account for when mounting that we leave that up to you. Most of our customers use self-tapping stainless screws from the hardware store. In most cases, 4 will suffice but some choose to use 6 screws. The other option is to have someone hold the door guard in place over the stock holes and use a marker to mark through the holes on your new guard. From there the holes can be drilled out and bolts can be used. 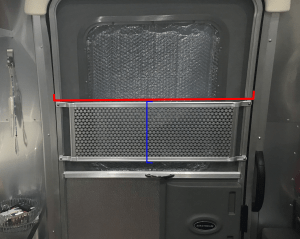 On some Airstream models, a couple of the window screws can come in contact with the door guard and cause scratches. To remedy this, swap the factory round head screws with flat head screws. Pricing for our custom door guards is $150 plus shipping. This includes up to two hours of design time. Please give us as much detail as you can about your desired design, so we can be as efficient as possible with our design. If we have to do multiple redesigns or changes that extend over two hours, additional design fees will be added. We can’t wait to see the ideas you come up with. Copyright © Weathered and Worn All rights reserved.